"Just leave it all to me. 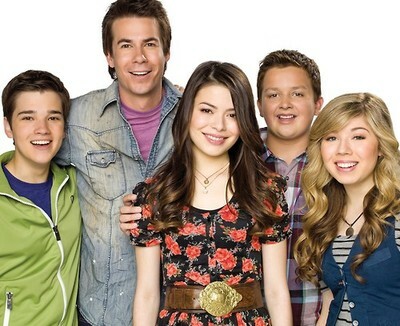 "note From left to right: Freddie, Spencer, Carly, Gibby and Sam. Carly and Sam: And this is...iCarly ! iCarly (2007-2012) was a Nickelodeon teen sitcom created by Dan Schneider. Carly Shay (Miranda Cosgrove) is a lass in her mid-teens living in Seattle with her big brother and guardian Spencer (Jerry Trainor), whose father has been deployed in the military for a decade or so. After an accident where her comments on a Sadist Teacher's talent show made it onto a YouTube-like site, the positive internet reaction inspires her to make a creative web show with her two best friends. Samantha "Sam" Puckett (Jennette McCurdy) is a detention hall regular (and had been arrested several times) who craves meat, frequently mentions that her relatives are in prison or in parole, and keeps an array of dangerous tools in her backpack and locker. Fredward "Freddie" Benson (Nathan Kress) is an intelligent tech-savvy boy who works as the camera man and keeps the iCarly site running. Along with his long-term crush on Carly, he has an extremely overprotective and neurotic mother (Mary Scheer). As part of the Nick Verse, the show is a Spiritual Successor to Drake & Josh being produced by the same people, and also including Miranda Cosgrove leading the cast as Carly with that show's Ensemble Dark Horse, Jerry "Crazy Steve" Trainor, as Spencer. The two shows could be assumed to be in a wider world setting, with various Schneider-verse references showing up like Galaxy Wars, Daka Shoes, the Gary Coleman Grill, Peruvian Puff Peppers, and the Parker-Nichols Hotel. And don't forget the loads of adult jokes and innuendos inserted into the show. Interweaved amongst the webshow and school shenanigans are relationship issues between the Freudian Trio. A Love Triangle slowly brewed amongst the three despite Status Quo Is God. The online fandom latched on to this, creating one of the biggest Nickelodeon shipping wars ever and rivaling some of the greatest Internet Backdrafts. There are a lot of fandom tropes discussed across the various pages for the show, such that the actual term Shipping and the associated pairings (complete with Portmanteau Couple Name) has been directly referenced in the show. It had a Crossover episode iParty With Victorious (officially deemed as 3 iCarly episodes that are canon for both shows). Despite its very good viewership in the first few seasons the show suffered a lot from very unstable air dates, coupled by a very polarizing story arc that scattered the fanbase even further. The show ended its run on November 23, 2012 with the final episode iGoodBye. Following this, Nickelodeon announced the creation of two Spin Offs. The first is Sam & Cat (Cat being from Victorious) in a cross-over that was picked up for a first season in 2013 before being cancelled in 2014. The second involved Gibby but it was not picked up for a full series. Aside from a character sheet, other sections are listed on the header links as well as a Ho Yay/Les Yay page. Subjective and fandom-related tropes are under the YMMV link.